Since we have placed ourselves in a unique spot, we truly have a front seat view of the wholesale VoIP industry. Not only do we occupy that front seat, but we also play a large role in the direction that the industry is moving. The attitude we have toward transparency in the products we develop has been our proven key to success. Since we’ve added the ability to view and select carriers, our BackOffice platform, Titanium III, has become a tool unlike any other. Once a customer is logged in to the BackOffice, they can view and select services such as DIDs, origination or termination, from a list of the industry’s top carriers. The control is completely in the customers hands when it comes to using or not using a specific carrier. The Conference Line feature that we just added to our industry leading BackOffice was designed to help further meet our customers varying VoIP service needs. This feature was requested multiple time by our customers, and since we place a HUGE emphasis on the feedback from our customers, the Conference Line was added. We’re Showcasing our BackOffice at the ITEXPO! We rolled out our impressive BackOffice, Titanium III, in 2011 and since then we’ve been doing nonstop updates on it. Each update we do is designed to make it more functional for our customers and from their feedback it seems to be working. The ITEXPO is quickly approaching and we will be showcasing Titanium III, as well as our new and improved Titanium Private Label (TPL) BackOffice (you can expect another blog post with TPL features next week). Since there have been so many updates to the BackOffice, it makes sense to do a rundown on what’s been added. Let’s first give you a brief background on what it is that our BackOffice actually is. Titanium III is the unique BackOffice we offer to our customers. It was designed to provide them with aggregated, automated and innovative way to operate their business. Anyone can provide wholesale VoIP services, but very few can provide those services AND give customers the tools and metrics that they need to effectively and efficiently manage their accounts in one, easy to use BackOffice. With that being said, let’s get down to business and review the changes we’ve made since the start of this year. This is the second major release we've had at VoIP Innovations this week! 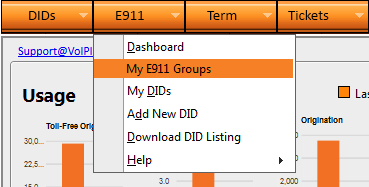 Today we launched a new My E911 Groups feature to our BackOffice, Titanium III. These groups are equipped with the tools and metrics that are needed to easily manage a customer’s E911 data. VoIP Innovations has deployed a system that will notify customers if they are experiencing a switch failure when inbound calls are taking place. The idea for this service was formulated around customer experience and account security, as well as to save customers time and money.